The Yakima/Klickitat Fisheries Project (YKFP) is an adaptive management and research project designed to restore anadromous fish and the habitats that support them in the Yakima and Klickitat subbasins in south central Washington state. In the Klickitat River subbasin, the YKFP is a research-driven project that guides implementation of fisheries enhancement and stream habitat preservation and restoration. · apply knowledge gained about integrated hatchery programs throughout the Columbia River Basin. · monitor fisheries and habitat conditions to gauge project effectiveness. The YKFP proposes the use of an integrated hatchery program to increase natural salmonid production while maintaining long-term fitness of endemic salmon stocks. Comprised of fishery managers, biologists and technicians from the Yakama Nation and Washington Department of Fish and Wildlife (WDFW), the project is designed to provide harvest opportunities for tribal and sport fishers. The framework for adaptive management guides the planning, implementation, and evaluation of the YKFP-Klickitat. The YKFP is sponsored in large part by the Bonneville Power Administration (BPA) with oversight and guidance from the Hatchery Scientific Review Group (HSRG) and the Northwest Power and Conservation Council (NPCC). 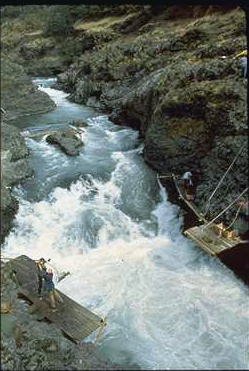 The YKFP is the co-manager of the fisheries in the Klickitat River Basin. Sport fishing regulations for the Klickitat are set by Washington Department of Fish and Wildlife. Link to the Yakama Nation Fisheries Program web site, and the official Yakama Nation web site.